This is the most quoted reason many of my friends give me when we talk about the things we want to pursue in life. I agree, it can be hard to take time out for the things we love. What if we gave it just FIVE minutes though? I have always loved brush lettering and have been wanting to improve mine. Since few days, I have been giving myself five minutes every evening to practice. I will quickly grab my markers, some paper and would just sit on the dining table and letter. Amina might be napping or playing or even sitting on my lap. After a while Talha and Aisha would curiously come next to me and start writing as well. 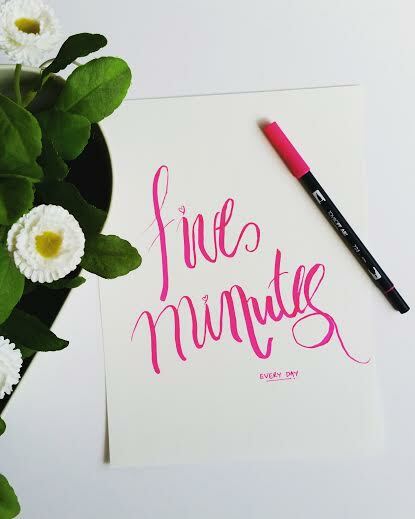 Before you know it, we are all happily chatting with each other while lettering and five minutes somehow becomes thirty or more. I am nowhere near where I want to be, but I am happy I am practicing. Go on, give yourself 5 minutes tonight and see where it will take you. Do keep me in the loop!